This is a quick TTT...crazy week around our house with an upcoming fundraiser. I saw this idea somewhere a long time ago and thought I would pass it along to those of you who haven't seen it. 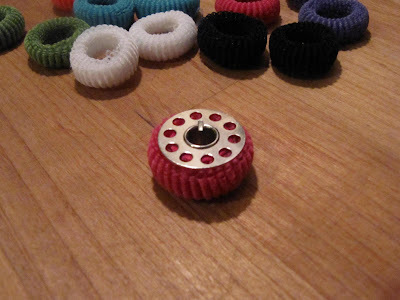 This is such a great idea for those little unruly bobbins loaded with thread. They just keep unwinding and unwinding...especially if you are traveling with them to a class. Here's your solution: mini hair elastics. They are the stretchy, fluffy kind. Great for these little devils. They come in many colors, so you can even match them to the thread. Just slip it over the bobbin and that thread isn't going any where. A neat and tidy bundle. It's a quick one, but oh so helpful!!!! I've been using this method for a couple of years now. Before that though - what a mess!! Wow what a great idea. I will be on the look out for some of these. Such an easy remedy for such an annoying problem. Karen I have been following your wonderful/creative ideas and I have to say I love this one!! what a great idea. Thanks for sharing your fantastic ideas!! my grandmother was the same way she was always thinking of "how to" or "what if I" or "I can use this for" her ideas should have been pattened. Quick, easy, fast and OH so helpful. Thanks, Karen. Awesome idea and cheap too! I'm off to the dollar store. Great idea! why didn't I think of it. I used one of those the other day for a spool of thread. It was one of those ones with a narrow cardboard center (no notch for the thread), and it was a super slinky nylon embroidery thread that was going all over the place. 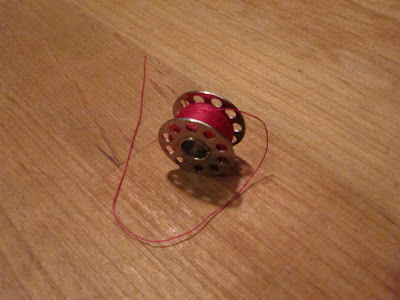 I remembered this trick for bobbins, and was happy to find that it worked for a regular spool too. Yay! Thank you so much for the idea....Now why didn't I think of that!! I've used these for awhile and I use them for spools of thread, too. Cheap and very effective! Great idea Karen, thanks for sharing! I didn't know about it! Thanks Karen. You never disappoint us with your continual fount of ideas. Love to check out what you will come up with next. Another fabulous idea - what would we all do without you!!! Very clever you are. Great idea. I need some of these NOW! Thanks Karen! I mailed off my blocks to you today. Uff I`m saved! thank you for sharing this! if the twin grandaughters have any. Brilliant! You other idea of the golf tee was cute but not practical for me as I keep bobbins and thread on the rack at an angle. But this is an excellent idea as those bobbins like nothing better than to unfurl while hanging on sed rack. Picking up some hair things is now on my to do list! This is the most brilliant and most useful tip I've ever received! Thanks! 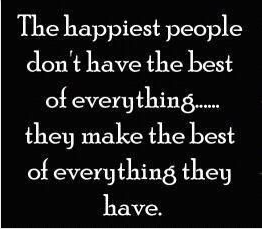 I have a few of those, thanks to a teacher who found a large bag at one of those dollar stores. She handed them out during a class. What a great idea!!! Thank you! Thanks for the tip. My machine has a box attached for bobbins, feet, etc. The bobbins are hard to get out, the slots for them are too deep and I can't get a good grip to pick them up. With the ponytail holders, the bobbins stick up a little higher and I can get them out easier. Thanks!! This falls into the "now why didn't I think of that" category! That is a smart idea, mine are always rolling off the table and unwinding. How neat! Great solution, bobbin warmers, I like it. This is such a cool idea, one of those "why didn't I think of this sooner". Love it, love it, love it! Thank you! I cannot wait to try this out. The earlier one was my preview, hadn't published it yet. What a great idea!. Can wait to try it. WOW. You just rocked my world. Do you have any ideas for something to do with the extra 2" slats that I have leftover from shortening 17 window blinds. I hate to throw them away, they must be good for something. One idea I did see was to use them for plant markers. I look forward to your post every Tuesday; I am a New England native (now living in NC) and a gadget nut! Keep up the great work. Thanks for this really super tip! 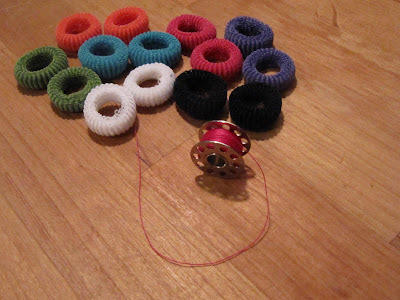 This idea solves one of my pet peeves, threads tangling off my bobbins! 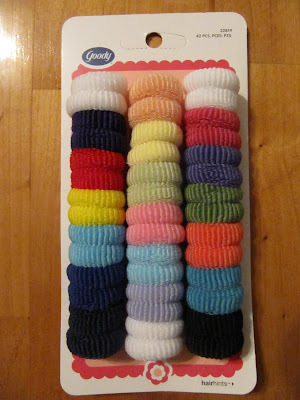 Thanks, I can't wait to get to someplace that sells these little pony tail holders! WOW... Such a BRILLIANT idea... I have bought so many different varieties of bobbin holders/cases its just crazy but still I have bobbin threads hanging out, unravelling, becoming tangled etc etc... This is going to revolutionise my bobbin collection... WOO HOO! Love LOVE ♥LOVE♥ it! 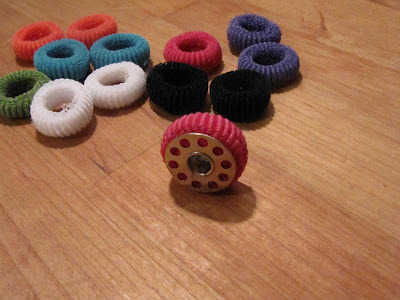 This is the best solution to keeping bobbins intact that I have ever seen. You should send this tip to Fons&Porter for their tip segment. Its like you looked into my Sewing box and are speaking right to me. I cannot WAIT to get to the store tomorrow and fix that mess! I started using these after seeing them in a sewing catalog. But they were expensive by the time I would hav payed the shipping. One day I was at the Dollar Store, (we have Dollar Tree), I found a bag of 250 for $1.00. The quality may not be as good as the fancy ones, but w Ith a 3 year old granddaughter, they disappear often.